With a sharp neon aesthetic, it flips but doesn’t flop. 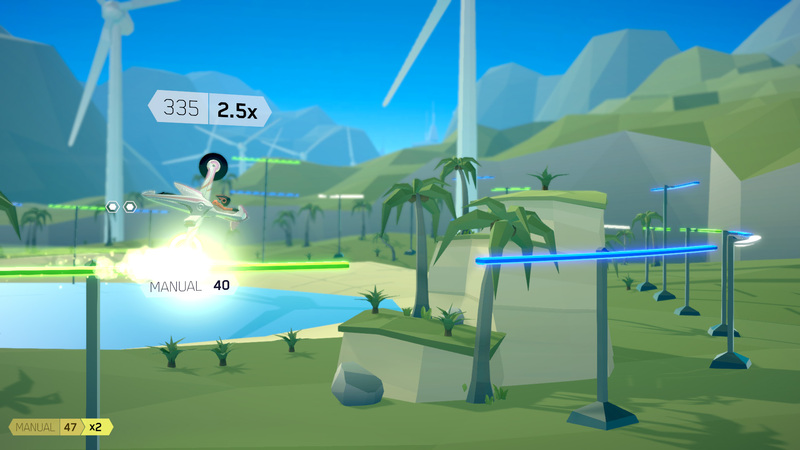 FutureGrind has all the makings of a classic arcade game wrapped in pretty low-poly graphics. 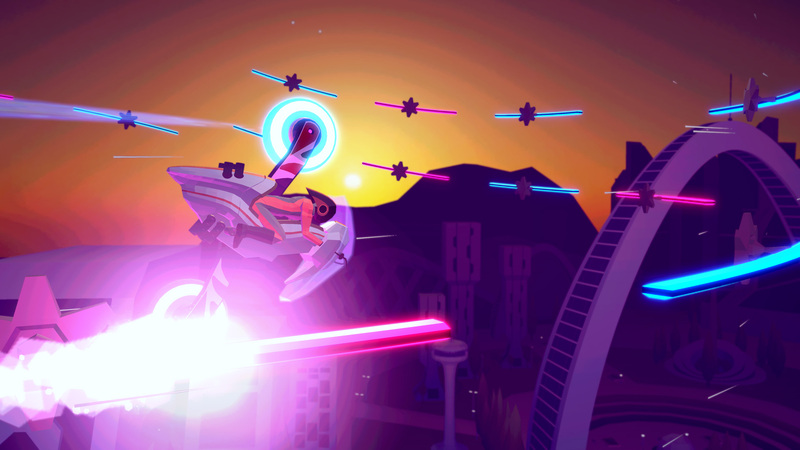 FutureGrind is the latest game by indie developer Milkbag Games. Everything you need to know is all in the name – it’s the future, you ride bikes and grind rails. It’s also about stopping an evil corporation by grinding and hacking into strange glitches in the future world, and looking stylish while doing so. In FutureGrind you ride motorcycles with wheels on the top and bottom. You can flip your bike, jump to and grind your way to the finish line. By executing flips and rail transitions, you build up combos and rack up high scores while avoiding rails in a different color from the color of your wheels. The simple controls make the game very easy to pick up, but the intense action makes it difficult to let go. Every time you crash your bike, you can quickly restart the level with the push of the button. As the levels got more and more intense, I found myself crashing and resetting, probably more than a hundred times every race, without noticing. It’s that feeling that “you’ll get it right the next time” which drives you forward when playing FutureGrind. It’s the same feeling you get from classic arcade games, and it’s a good feeling. After advancing a couple of levels, you’ll begin unlocking new bikes. Each one plays differently – one bike has wheels in different sizes and colors, and one bike only has only one wheel with alternating colors. The levels in FutureGrind are static, with no random factors (except for a couple of particular levels). You just need to find the best way to grind through the level and repeat doing that until you manage to beat it. It can take a few resets until you get absorbed in the level, but when you do, it becomes so automatic, that it almost feels like putting in a cheat code. It’s when things go sideways that you find yourself improvising, and acting on instinct. That is when FutureGrind shines at its brightest. It’s fun to improvise through the branching paths and the multiple ways you can grind a rail. It adds the needed depth to levels to make them entertaining and replayable, even after playing them over and over a hundred times. Finding out how to utilize your bike’s advantages to tackle the level gives FutureGrind almost puzzle-like gameplay. Apart from grinding for high scores, every world has two tasks for you to complete. These tasks range from executing a specific trick to avoiding the white and normally safe rail. There’s even a level where you are not supposed to perform complete flips throughout it. Also, the story incorporates special levels where you hack into devices scattered in the regions where the game takes place. These hacking levels do not have much depth but give a cute spin on the gameplay and a more traditional platforming experience – one where you reach a target, not a score. FutureGrind, like any good futuristic game, has a story about an evil corporation and a rebellion. In FutureGrind, that evil corporation is one of the sponsors in the sport that is griding neon-colored lines. Between races, you will receive text messages from the different sponsors, some are good guys, some are evil. You will also get hidden messages from a mysterious entity that hacks into your communications. It’s a very straightforward plot, but it’s fun even without a lot of depth. It serves as a good driving force for the different levels and missions. 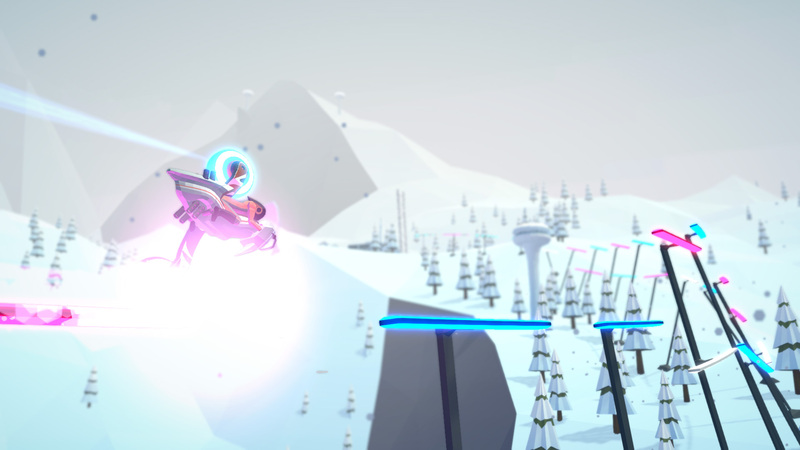 FutureGrind is all about glowing colors that fit together in a parade of bright lights. The backdrops are neat and low-poly, but each one feels unique and exciting. The levels themselves have you twisting above and under these beautiful environments, giving an exhilarating feeling of vertigo along the way. But the colors of FutureGrind don’t get in the way of the gameplay. Everything is clean, and you can always easily see your vehicle and the track clearly, with no distractions. The bass-heavy electronic music by bignic mixes fantastically with the neon visuals. The beats keep you focused on the track ahead of you, and never get tiring, even after you play the levels over for the hundredth time. FutureGrind took me entirely by surprise. Its intense and straightforward gameplay make it an instant classic. I was hypnotized, playing the same levels again and again, until I finally made it to the end. Then, I played them again to get a better score. Everything is stylized with a pretty neon aesthetic, and the music is just the right amount of futuristic. 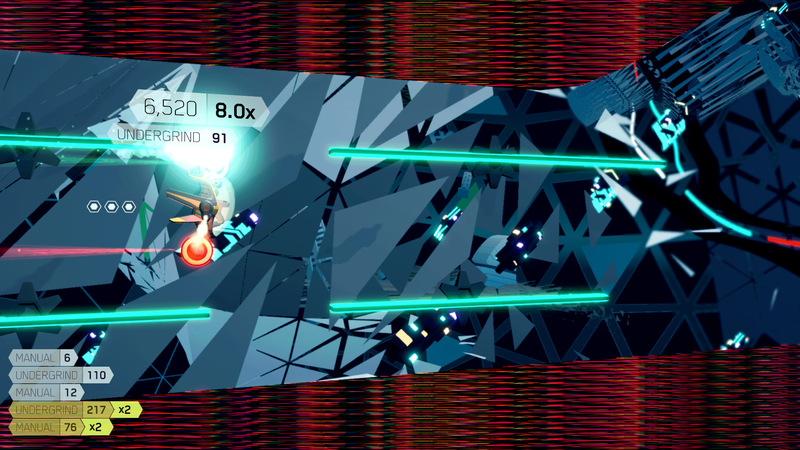 So if you’re a platformer fan with a soft spot for flashy visuals, FutureGrind might do the trick for you.